We've all heard tell that, for just about anything, 'there's an app for that,' and it seems the saying's not far wrong. Apple claims its iPhone App store has over 350,000 apps, and other smartphones make up tens of thousands more. It's no surprise, given these numbers that health and fitness apps have exploded, as well. 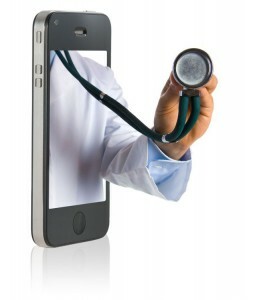 According to Mobihealthnews, as of April 2012 there were more than 13,600 iPhone health and fitness apps available. And the situation is not static. The FDA's research indicates 500 million smartphone users worldwide will be using a health care application by 2015. These applications range from mood charting for mental disorders, to tracking biking, walking and running times and distances, to smoking cessation assistance to apps assisting ovarian cancer surgery--and that doesn't scrape the surface. But the market has been almost completely unregulated. Just a couple representative examples: Mobile apps “AcneApp” and “Acne Pwner”, sold in Apple’s iTunes Store and Google’s Android Marketplace, made false health claims without any scientific evidence to back them up. Their ads claimed the apps could treat acne with colored lights from the phone, a claim that spoke to nearly 15,000 people, who downloaded the apps. But the Federal Trade Commission was having none of it, and in the FTC settlement, the developers were fined and prevented from making any more promises without research to support them. So how is the average consumer to know if her health app lives up to the claims it makes? In some cases the claims may seem relatively trivial (‘phoning’ away your acne, say), but in others the apps assert they can assist physicians in diagnosis and treatment of serious illnesses. There clearly is need for a supervisory body with experience in medical applications and devices. Enter the Food and Drug Administration. The FDA has a public health responsibility to oversee the safety and effectiveness of a small subset of mobile medical applications that present a potential risk to patients if they do not work as intended. . . . Through draft guidance releases on July 19, 2011 the FDA defined a small subset of mobile medical apps that may impact on the performance or functionality of currently regulated medical devices and as such, will require FDA oversight." "Products that are built with or consist of computer and/or software components or applications are subject to regulation as devices when they meet the definition of a device in section 201(h) of the FD&C Act. That provision defines a device as “. . . an instrument, apparatus, implement, machine, contrivance, implant, in vitro reagent . . .,'' that is “. . . intended for use in the diagnosis of disease or other conditions, or in the cure, mitigation, treatment, or prevention of disease, in man . . .'' or `` . . . intended to affect the structure or any function of the body of man or other animals. . . ."
In short, the FDA wants to monitor the relatively small number of mobile apps that could present a risk to patients if the apps don’t work as intended by the developers. Make suggestions regarding a patient's diagnosis and treatment. What does that mean, practically speaking, in terms of the FDA's involvement? Well, something some app developers aren't too happy about. But Dr. Jeffrey Shuren, head of the FDA's Center for Devices and Radiological Health, makes it clear that the FDA has no intention of reviewing the vast majority of apps. "When it's being used to diagnose patients, it's a medical device we believe subject to FDA oversight." However, in the vast majority of health and wellness apps, those that deal with healthier life styles, "the risks to patients [in using them] are very, very low," he says. Rather it is those that calculate whether a mole is cancerous, determine how much blood thinner to give heart attack patients, read X-rays, ultrasounds and CT scans, and the like that concern the FDA. And so, without even a full sense of where their regulation would lead, the FDA began accepting submissions for approval. In February of 2011, the very first medical mobile health app received FDA approval. Mobile MIM, developed by MIM Software, lets healthcare professionals send the medical imagery from CT scans and MRI images to an iPhone, iPad, or iPod Touch to analyze them. It made it through all regulatory hurdles, and is now an FDA approved app. Another example shows the rigor required to get approval--and also how these medical apps differ from, say, iBiker. The FDA granted WellDoc clearance to market its WellDoc DiabetesManager System to care providers and adult patients with type 2 diabetes. The system commercially launched in early 2011. But it isn't the typical app you would download from the App Store. The DiabetesManager, which actually underwent clinical trials, collects information about the consumer's blood sugar levels, diet, and medicines through a smartphone app, a cellphone or a desktop computer, and then both offers advice about the beset food to eat in response to sugar readings and uses an algorithm to analyze the data and send recommendations to the doctor. It's vastly more sophisticated that most of the wellness apps out there--and both the approval and the price tag reflect that. The FDA approved the system to operate as a medical device. But at over $100 a month, it doesn't bear much resemblance to the cost (or lack thereof) of most health and fitness apps. Just this September 10th, Preventice™, Inc., a leading developer of mobile health apps and remote monitoring systems, announced that the FDA had approved its BodyGuardian Remote Monitoring System (RMS) which supports remote monitoring for people with cardiac arrhythmias. A body sensor is attached to the patient's chest to collect important data, such as heart and respiration rate and activity level, and that data is sent to healthcare providers through mobile phone technology. However, as of today, less than 10 apps have received approval. In fact, requiring FDA approval has some real downsides––and a large number of questions remain about how the FDA will handle its regulatory oversight. Over a year after releasing those original draft guidelines, the FDA is expected to finalize its guidelines by November for medical apps. It should come as no surprise that developers have some concerns. The Government Accountability Office found that the the FDA takes about six months to approve a medical device similar to an existing product and 20 months to approve a new device. That's not to mention the expense. A report entitled FDA Impact on U.S. Medical Technology Innovation found that the average cost of bringing a low-to-moderate medical device to market was $31 million with 77% of that ($24 million) spent on FDA-related activities. High-risk medical devices averaged $94 million, with $75 million spent on FDA requirements, or almost 80% of the cost of getting the device to market. The numbers are pretty staggering--and the time frame doesn't sit well with developers who are used to the fast-paced world of app-development. And, others ask, how will the under-manned FDA keep up with apps that constantly change and get upgraded? The question is a good one, and the issues of expense and time are problematic. So the FDA has its detractors in its efforts to move into mobile health regulation. But it will start its task with a limited scope. Despite that year since the first draft guidelines, the FDA still hasn't released its full final guidelines on how it will regulate mobile apps. Therefore it has made clear it will not go after all those applications that make untested medical claims until its final positions and rules are fully established. And despite the trepidation of many, some are gung-ho about the FDA's finally getting involved. Alain Labrique, director of global initiative at Johns Hopkins University dedicated to mobile health technology, acknowledges that FDA guidelines could delay app development, but highlights that they also protect the consumer. "protect the public and be sure that medical claims are supported by data assessment and some comparison to a gold standard." True--this might take longer, and it might cost more, but, says Labrique, "Making sure the public's best interests are met is not always the most expedient process." The day before this article was due for submission, news outlets reported that Representative Mike Honda, Democrat from California, was preparing to introduce legislation that would address Congressional concerns that the FDA is ill-prepared to handle the pace of development of mobile technology. Mobihealthnews reported that Honda aimed to help circumvent this issue by setting up an Office of Mobile Health within the current FDA structure. The office would be in charge of making recommendations to the FDA on issues related to health apps. The legislation is reportedly called the Healthcare Innovation and Marketplace Technologies Act (HIMTA). Announced on September 28th, the bill was said to be introduced “later this month,” although September ended on Sunday, with no further news.